National (adj): Of or relating to a nation or country, esp. as a whole; affecting or shared by a whole nation. 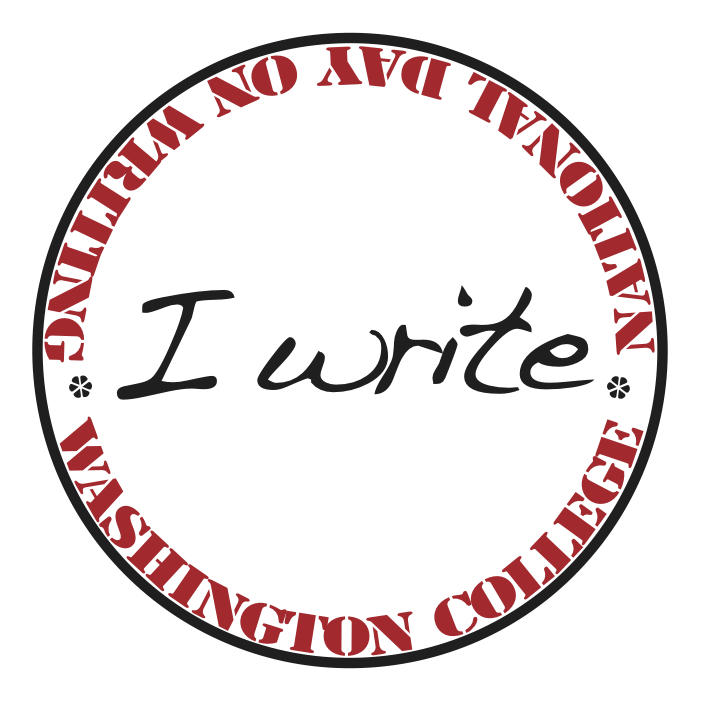 The National Day on Writing celebration at Washington College is coming up next Wednesday. Sponsored by the Writing Center, the Student Government Association, and Student publications, we’ll offer a day of celebratory writing. WILL THERE BE FOOD? Yes! We’ll have coffee and cookies to warm you up! We will be working to build a LIVING gallery on the library terrace. There will be clotheslines and poster presentation boards purely for the purpose of exhibiting student, staff, and faculty writing and written work you admire. We would love to have an exhibit that is truly representative of the kinds of writing we are all engaged with in our every day lives, from letters to lab reports, from poems to academic essays, from ethnographic case studies to email exchanges! You and/or your students are welcome to participate in a reading (from 1-2pm). Readers should be encouraged to bring 1-2 pages (roughly 2-3 minutes worth of material) to share. This can be anything from something you or your students have written to a piece of writing that is valuable to you. Have your students written something they are particularly proud of? Is there a singular work that was been inspirational to you as you entered your scholarly field? Share it all! Students, faculty, and staff are all welcomed to read. Contact us in advance to get on the list or sign up on the day! Sponsored by the Writing Center and Student Publications (The Elm, Pegasus, Writer’s Union & The Colophon, and The Washington College Review), a variety of writing-related activities will be set up throughout the day. Events include a yearbook photo caption contest, on-the-fly writing prompts, Washington College MAD LIBS, and writing POST-SECRET, and more! This is an opportunity for your students to have some fun with writing and also learn more about the student publications on campus. There will also be contests and a raffle for gift certificate prizes! You might also consider posting writing to the National Gallery of Writing. If you decide on an activity of your own, let us know what you’re up to! Nonce (n): For the particular occasion; for the time being, temporarily; for once. ← Festival (n): A time of festive celebration, a festal day. Also occasionally, a festive celebration, merry-making.